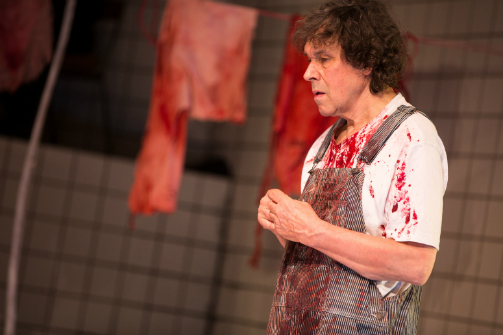 Stephen Rea in A Particle of Dread. Photo by Matthew Murphy. BOTTOM LINE: Entropy in the best possible way with passion and uniqueness to present the familiar tale of Oedipus. If I could just find a little nook or cranny, I would love to curl up and spend some time in Sam Shepard's mind. He is warped and comical, as well as profound. The ideas he develops are strange. Truly strange. So it is quite logical that in this scenario he utilizes an already outrageous circumstance to develop alongside his interpretation. With such a notable Greek tragedy, even if people did not study the story of Oedipus in school, the Oedipal Complex is discussed in a wide range of subjects including English and Psychology. In any case, I'll remind you of the two major parts. A man kills his father and sleeps with his mother. There are other characters thrown into the mix, like the blind prophet and a sister/daughter. Though most of those involved in the story hear the chilling prophecy early on, all parties involved think that they prevent the awful fate. A Particle of Dread is not a show one sees for an untold story. It is a show one sees for a familiar tale with a new presentation (here: a Southwestern setting in Las Vegas where Oedipus/Otto even has a stint as a hitchhiker in the Mohave). Shepard delivers his weird sensibilities through his wonderful dark and enlightening interpretation. During the disjointed order of scenes, I enjoy the organized chaos that ensues. While one scene is an older man in a wheelchair hearing about his daughter's criminal husband, another is a man who works in forensics analyzing the scene of the crime where Langos, the present-day reincarnation of Laius, was killed on the side of the highway. Director Nancy Meckler keeps the entropy under control and helps steer the production in the right direction. The ebb and flow of pain emitted from the characters pulls on our heartstrings. There is a silent power and energy Meckler infuses into each scene. Walking into the theatre the mood is already set by Frank Conway's spectacular design. Floor to ceiling white square tiles inspired the feeling in me similar to the popular scary movie Saw. My comparison is not simply about the industrial drain and the immense quantities of blood, but what its presence evokes in my mind. Waiting for the show to begin I sat there in anticipation and was pleased to have my senses tickled further by seeing live musicians on stage. Each aspect of the production works well together, bringing Shepard's strong point of view to the Signature Theatre's stage.